We were learning about airline meals earlier today at school during Food Technology. I would like to share some interesting information that I have read online with you! 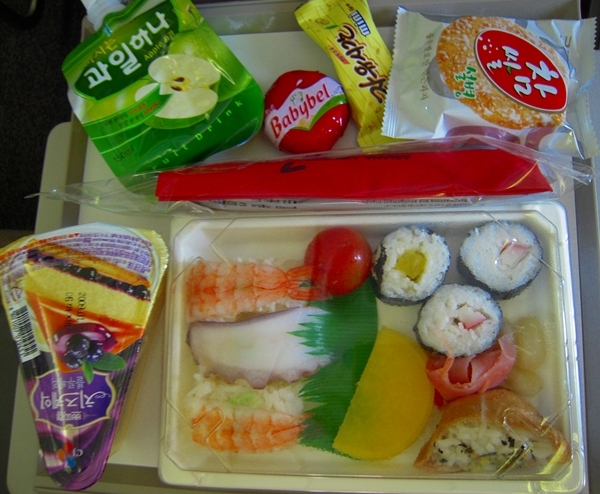 An airline meal is a meal served to passengers on board a flight. The first airline meal was served by Handley Page Transport, an airline company founded in 1919, to serve the London-Paris route. Passengers could choose from a selection of sandwiches and fruits. Up until now, LSG Sky Chef is the industries most structured and large-scaled provider of airline catering services. The type of food depends on the airline company itself and the class of travel. Airline dinner meals generally serve meat (chicken, fish, or beef), a salad or vegetable, a small bread roll with butter, and a dessert. Children's meals could also be purchased online when booking the flight tickets. Religious meals (kosher, Hindu), vegetarian/vegan diets, and medical diets are also served. For Islamic airlines such as Iran Air and Malaysia Airlines, pork and alcohol would not be served as Islamic traditions do not allow any of such foods. However, alcohol can be served upon the request from the passenger. During morning flights, continental breakfast would be served; traditional pancakes, fried eggs, and fruit and pastry by the side. Coffee, tea, and juice are offered and sometimes, (varying with airline company) hot chocolate as well. Some airline companies use metal cutlery but with the outbreak of SARS during 2003, most airlines have stopped using them as the disease can be easily transmitted. A large quantity of the airlines today use plastic cutlery that can be disposed immediately after use but others have once again reversed back to metal ones after the SARS outbreak. 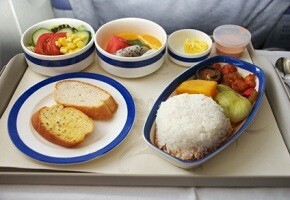 Airline meals are to be cooked ten hours before take-off. Chicken would be cooked to 60% and beef to 30%. They will be loaded onto the plane and then put into a convection ovens for twenty minutes where hot, dry air would be blasted over the food to reheat it. Open-flamed grill ovens are not allowed on air-flights. Newer planes might own steam ovens which are better at keeping the food moist. Meals on the plane would be more heavily salted and spiced as our taste buds are MIA* on the plane due to high altitudes. The lack of humidity on the plane and air conditioning would dry out our noses which loses 1/3 of our sense. Moreover, the air in the cabin is recycled every two to three minutes and plays a part in making us feel more thirsty. Fun Fact: Have you every ordered tomato juice on a flight? Try it next time! An observation shows that many people seem to order tomato juice on the plane. The extra acidity of the juice seems to taste nice at high altitudes to our numbed taste buds. Figures show that most people think that only ice-cream taste the same as it does on normal sea levels. However, the packaging, freezing, drying and storage are hard to manipulate any flavour at any altitude, let alone 30,000 feet. Fascinating!!! Thanks for sharing! One time Josiah dumped his entire tray of airplane food into the aisle. Oi!